Gilbuena, Cruz Cop MILO-Angeles | JustRunLah! ANGELES CITY – National athlete Miscelle Gilbuena and first-time winner James Kevin Cruz ruled the latest 41st National MILO Marathon regional qualifier held Sunday (August 6) at the Clark Parade Grounds. This mark’s the race’s return to the city after successfully hosting the 2015 National Finals. 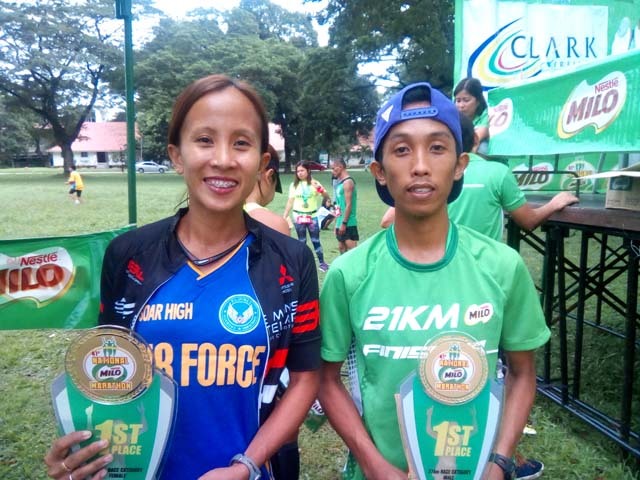 Gilbuena, a member of the Duathlon National Team, worked her way to the Women’s Division crown in 1:33:56 in a battle with last year’s Batangas Leg champion April Rose Diaz who clocked 1:34:48. Maximina Daltz checked in at a far Third Place in 1:52:39. Technically, Gilbuena can be considered the defending champion since she won the last Angeles qualifier in 2014. She also won the Tarlac qualifier in 2013. First-time winner Cruz towed a bunch of fresh faces in dominating the Men’s Division in 1:20:02 followed by Efraim Inigo (1:22:48) and Neo Anthony Saison (1:23:21). 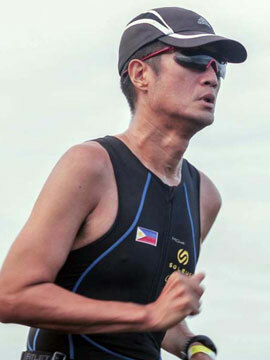 Prior to the race, Cruz’ best effort was taking Third Place in 21-kilometer category of the 2015 Metro Manila qualifiers. The champions received PHP 10,000.00, a trophy and gift items from sponsors. More importantly, they and all those who made the cut-off times of their respective age brackets will earn slots in the National Finals to be hosted by Cebu City on December 3, 2017. Other winners in the side events were Dominic Lagat (32:17) and Joneza Mae Sustiuedo (46:37) for 10 kilometers and Joevimark Villafuerte (16:17) and Joida Gagnao (20:20) for five kilometers. The three-kilometer race for those aged 12 years and below belonged to Alex Gatbunton (13:28) and Fidna May Orlanda (15:51). We joined hoping to earn a ticket to the National Finals. We still have 11 more chances to do so. Runners from Luzon can still catch the remaining four regional qualifiers in the coming weeks to be staged in the cities of Tarlac (August 13), Naga (August 27), Lucena (September 3) and Lipa (September 10). 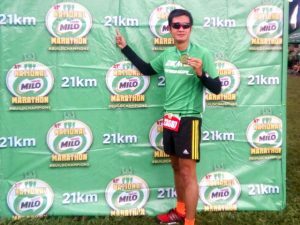 After that, the MILO Marathon begins its southern swing with a race in Tagbilaran City on September 24. Part of the registration fees collected will go to the MILO Marathon’s advocacy of giving free rubber shoes to poor but deserving public school children in the different host cities. Hopefully, a new generation of sports champions will be born out of these beneficiaries.